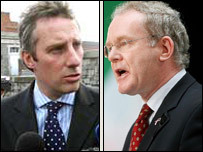 Deputy First Minister Martin McGuinness has hit out at Stormont government colleague Ian Paisley Jr for allegedly saying he is "repulsed" by gay people. The son of First Minister Ian Paisley insisted to Dublin's Hot Press magazine he did not hate homosexuals. He is a junior minister in the Office of the First and Deputy First Minister. Mr McGuinness told the Nolan Show: "Gay rights are enshrined in legislation and we as first and deputy first minister have a duty to uphold that." The Sinn Fein MP added: "Ian Paisley Jr wasn't speaking on behalf of the Office of the First and Deputy First Minister, he was speaking only for himself." He said they would have to examine what Mr Paisley Jr had said. "The responsibility to deal with this is with the Office of the First and Deputy First Minister (OFDFM), it lies primarily with Ian Paisley Snr," he said. "I don't know what he's going to do but I certainly think that we have a problem insofar as a junior minister in that department has expressed views which are a total contradiction of everything that the OFDFM is charged to do in terms of protecting the rights of all sorts of people within our society, including minorities." Mr Paisley is quoted as saying: "I am pretty repulsed by gay and lesbianism. I think it is wrong. "I think that those people harm themselves and - without caring about it - harm society. "That doesn't mean to say that I hate them. I mean, I hate what they do." Gay rights campaigner Andrew Muir said "dialogue and discussion" would be the mature way forward. "I wouldn't call for his resignation, but he should get the opportunity to withdraw his comments," he said. "It was the DUP's idea to have a pledge of office - one of the provisions is to promote equality, and I believe Mr Paisley has broken this pledge." The DUP said there was no suggestion Mr Paisley's comments were any form of discrimination.